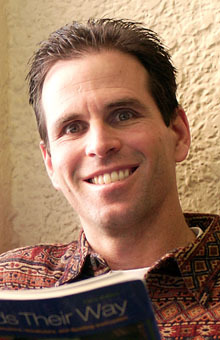 Patrick Manyak was the 2005-07 recipient of the Mary Garland Fellowship. Funding from the fellowship has enabled Patrick to publish research data related to young Latina/o children’s biliteracy development, to conduct research on elementary literacy instruction in several Wyoming schools, and to interview American Indian students at the University of Wyoming about their literacy histories. As a result of this work, Patrick published four articles in leading scholarly and practitioner journals, including the Journal of Early Childhood Literacy and The Reading Teacher, and two chapters in important edited books, including the highly respected International Handbook of English Language Teaching. Patrick also co-edited the book Home-School Connections in a Multicultural Society: Learning From and With Culturally and Linguistically Diverse Families. Finally, Patrick was invited to serve as the editor of the English learner department of The Reading Teacher and to be a member of the editorial review boards of the prestigious Journal of Literacy Research and Research in the Teaching of English. Patrick has taught over 200 preservice teachers and an equal number of Wyoming teachers in the UW’s teacher education and reading endorsement programs. He has also conducted workshops on literacy instruction for 25 percent of the school districts in Wyoming. Patrick was a principal investigator for a federally funded research project aimed at developing and researching a comprehensive vocabulary instruction program for upper elementary students in schools with high percentages of English learners and children from low-income families and has two grant proposals pending that would result in over five million dollars of funding to extend this research in the future.